The world knows William Shakespeare. Author of the most beloved plays and poems in the English language, Shakespeare’s name has become a household word. To speak it is to conjure up murderous villains, court jesters, hapless heroes, and fated lovers. His is Macbeth, Hamlet, Brutus and Cassius, Romeo and Juliet, Prince Hal and his beloved Falstaff, Katherine the Shrew and her rough match Petruchio. The world’s a stage, and these faces continue to strut and fret, timeless in their moment, eternal in their utterance. So profound is the influence Shakespeare has had on the world through his art that his characters have become types, his plots patterns for other artists, his linguistics and syntax the stuff of style books. Yet, few know that this towering author was born humbly and educated in public grammar schools through only the eighth grade. Fewer still realize that he curated his spectacular stories from other literary narratives and history books. Third of eight children born to a glovemaker, William exceeded all expectations. He married an older woman at the age of 19, one Anne Hathaway of Stratford. Together they produced three children, two of them twins. In the late 1500’s, Shakespeare ventured to London to pursue a career in acting and playwriting. A member of Christopher Marlowe’s theater, and shortly thereafter James Burbage’s theater, he gained reputation and experience, coming to understand both the art and the audience it drew. He published poems such as Venus and Adonis (1592) before turning to theater with his The Comedy of Errors and Henry VI. Contemporary reviews belie the envious admiration he inspired in his peers, who called him “an upstart crow, beautified with our feathers.” By 1594, Shakespeare had composed five plays, which he performed with Burbage’s acting company, the Lord Chamberlain’s Men. Recognizing genius, Burbage made him partner. During this time, he wrote the parts of Romeo, Prince Hal, Hamlet, Othello, King Lear, and Macbeth to be performed by Burbage’s son, Richard, who certainly had no notion of the great honor accorded to him in originating these historic roles. While popular plays in Shakespeare’s time narrated ancient histories, William staged the history of the English people, in this way not only preserving the nation’s history, but in a real sense authoring it. In narrating the stories, he influenced how particular historic figures would be remembered by future generations. Was Richard III as dastardly as Shakespeare paints him? He will ever be remembered so. Was Prince Hal so cold to his friend, Falstaff? Shakespeare didn’t merely record the histories of his people, he turned them into art, shaping his narratives to highlight themes, develop ideas, and censure behaviors accordingly. Thus, in a real sense, he contributed largely to the sensibilities and self-perception of the English people. When Burbage lost his lease on the land that held his theater, he and his men deconstructed the theater in the secret of night and erected a new theater, the Globe, on the other side of the Thames. There Shakespeare staged As You Like It, Henry V, and Julius Caesar. When in 1601, the Earl of Southampton commissioned him to stage Richard II, he was accused of treason against the crown of Queen Elizabeth; however, he escaped with merely a hand slap from her majesty. Essex, the leader of the coup, was executed and Southampton imprisoned. Yet, Shakespeare, the upstart crow, remained the darling of the hour. When Queen Elizabeth died, James I became the patron of Shakespeare’s company, which became known as the King’s Men. It was for this Scottish king that Shakespeare wrote Macbeth, and observant viewers will discover in the character Banquo’s mirror an homage to James’s crown. The subject of the story, an ambitious soldier that usurps the throne and reigns in tyrrany until his betters put him down, seems a conscious effort to assure the king of his own devotion to the Lord’s chosen monarch. And curst be he who moves my bones. Shakespeare’s friends collected and published his works posthumously in 1623 in the First Folio. Some of the plays it contains differ from previous manuscripts, since these exist largely from what men were able to copy down and actors themselves remembered from viewing and acting in the stage plays. Evans, G. Blakemore. The Riverside Shakespeare. Houghton Mifflin Company, 1974. 2017, https://www.biography.com/people/william-shakespeare-9480323. 8 Nov. 2017. 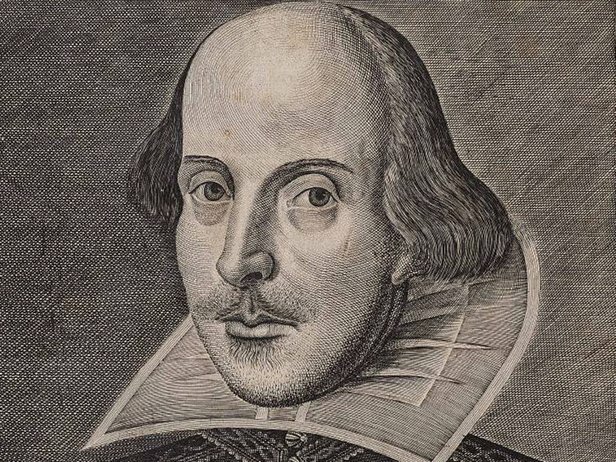 Author.” Britannica.com website, https://www.britannica.com/biography/William-Shakespeare. 8 November, 2017.